If you like earbuds, but are looking for better ones than those that came with your iPod, there aren't many choices -- after all, Apple's earbuds are better than most, and earbuds can only do so much. That being said, we've long been fans of Sennheiser's $15 MX 400 and $20 MX 500, and we've recently found two new favorites that we can recommend, as well: AKG's $20 K12P and $26 K14P. In many ways the AKG and Sennheiser offerings are very similar: Both companies offer a standard model (MX 400 and K12P) and a model with an inline volume control that is otherwise identical (MX 500 and K14P). All four models come with a plastic, wind-up carrying case and foam earpads. In terms of sound quality, when compared to the iPod's stock earbuds, all four also provide better overall sound with improved bass response. 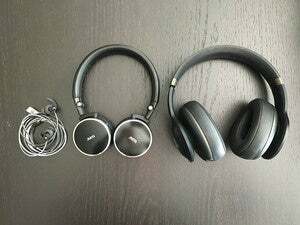 However, the Sennheiser 'buds also give you better midrange, whereas the AKG models add noticeably better treble response. Granted, given that these are still earbuds, we're not talking huge differences. But if you're in the market to upgrade, the Sennheiser and AKG 'buds are all highly recommended. If you like detail, go for the AKGs; otherwise, choose the Sennheisers.